Adidas and the NCAA now have a t-shirt to commemerate Kevin Ware's broken leg. You almost have to tip your cap: no non-profit does buccaneer profiteering quite like the NCAA. What other institution would see a tibia snap through a 20-year-old's skin on national television and see dollar signs? In accordance with their rules aimed at preserving the sanctity of amateurism, not one dime from these shirts will go to Kevin Ware or his family. Not one dime will go toward Kevin Ware’s medical bills if his rehab ends up beneath the $90,000 deductible necessary to access the NCAA’s catastrophic injury medical coverage. Not one dime will go towards rehab he may need later in life. "Going forward, we don't know what's going to happen in terms of medical expenses," said Ramogi Huma, president of the National College Players Association, a group trying to organize NCAA athletes. "If Kevin has lifelong medical bills associated with his injury, he could be squarely responsible for this…These are things that are not guaranteed to players that are injured, and no matter how hard it might be for people to understand, that's the truth. And that should change." Where will the t-shirt money go? Well, Coach Rick Pitino makes more than $4 million a year and will likely see his current five-year deal torn up and renegotiated following the season. The assistant coaches, trainers and support staff will also surely get a taste. *** The Final Four ratings boost spurred from the buzz surrounding Kevin Ware's story will also translate into quite the windfall for the NCAA. The multi-billion-dollar slop bucket of March Madness money, which makes up 96 percent of the NCAA’s operating budget, will pay organization president Mark Emmert's two million dollar salary as well as the paychecks for their 14 vice presidents, each of whom make at least $400,000 a year. They will also to be able to continue to pay off the mortgage on their new $50 million, 116,000-square-foot headquarters in Indianapolis. Athletic directors, like Pat Haden at USC, are already lamenting that if they lose this lawsuit, it could mean no more funding for non-revenue sports. But here’s an idea. Why not just make every coach’s salary no greater than the average wage of a tenured professor? Why not end the practice that has football and basketball coaches stand as the highest paid public employees in their states? That money alone should allow for the funding of non-revenue sports while also allowing players a piece of the four billion dollars in revenue earned off of their images in videogames, commercials and memorabilia. 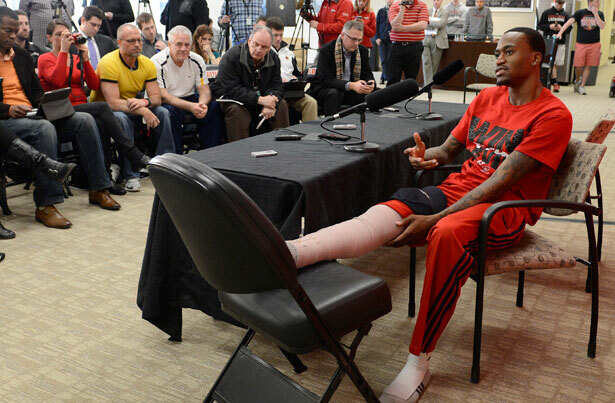 As for Kevin Ware, he returned to Louisville this week, his coach by his side. Coach Pitino announced that he is healthy enough to be in Atlanta for the Final Four, cheering on his teammates. Ware is now a newly minted media star: a 21st century George Gipp with the benefit of having a story that’s actually true. Unfortunately the school won’t even say publicly, if rehab doesn’t go as planned, whether he’ll still have a scholarship waiting for him when he returns in the fall. The official word from Louisville is that the question is irrelevant because “doctors are expecting a full recovery.” One thing is certain. At least he’ll get a lousy t-shirt. *** after this article went to print, the Louisville athletic department announced that they would not take any direct funds from these t-shirt sales. Instead profits will go to Adidas as well as Louisville's general scholarship fund. As Brian Frederick of the Sports Fan's Coalition put it, "We can say that shirt money is being laundered." For the private prison industry—and Gang of Eight leader Chuck Schumer—immigrant-unfriendly legislation means profit. Read Aura Bogado's take.